Grubs are the white or off-white larvae of Japanese Beetles and June Bugs. These ¼" to 1 ½" long bugs work under the surface destroying turf’s roots. So, by the time you see signs of grubs, much of the damage has already been done. 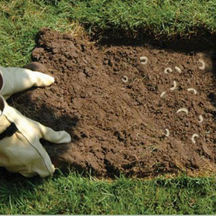 As few as six grubs per square foot can cause quite a bit of damage in your lawn. They can be one of the most destructive lawn pests unless they are detected early and treated properly. How Do You Know Grubs Have Been At Work? 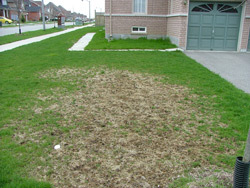 Turf begins to wilt and turn brown, creating dead spots throughout the lawn. Lawn easily rolls up like a carpet in damaged areas because of the root damage. Skunks and raccoons are digging up your yard looking for grubs, one of their favorite snacks. Grubs may attract moles as well. Prevention is, by far, the most effective treatment for grubs. New generation insecticides are applied in the summer during the egg-laying stage and offer one full year of guaranteed continuous protection. Call today if you suspect your lawn may have a grub problem. 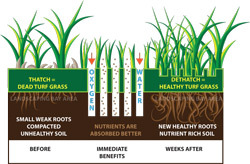 We will be glad to evaluate your lawn and help you decide the best course of action. Green Planet can apply a guaranteed preventative treatment to control these devastating insects before they can cause damage to your lawn. If you see ridges of dead or dying grass or mounds of dirt throughout your yard, this is certain evidence of a mole invasion. Moles can do more than make a mess of your lawn and garden. Mole ridges, mounds and tunnels are unsightly on lawns and can be disruptive to the root systems of landscape and garden plants. In addition, moles are known to tunnel under driveways or slab foundations thereby weakening the underlying structure causing damage that can run into the thousands of dollars. It is always better to stop moles before the damage has been done. 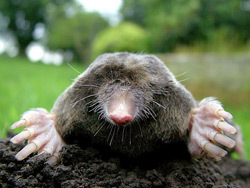 If you are like most homeowners, you are probably confused by all of the conflicting advice on mole control. The mole's primary food source are earthworms, so trying to control white grubs and lawn insects is no protection from mole activity. In fact, many chemicals and home remedies, including castor oil, sonic devices and grub controls, are not only ineffective when dealing with moles, but they allow the animals time to establish and become real problems. We use a product called Talpirid which is a mild toxin specifically designed to kill moles. Since the mole’s main food source is the earthworm, Talpirid is designed to have the exact look, feel and scent of an earthworm. The Talpirid worm is placed directly into the mole tunnels where it mimics the mole’s natural food source. The moles will feast on the Talpirid earthworm and then it’s “Bye Bye” moles within 24 to 48 hours. With present mosquito controls, the solution is temporary at best. Citronella candles, smelly repellants, zappers and torches all do a poor job of controlling mosquitoes. 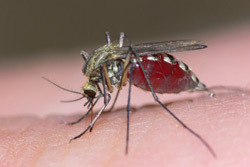 Fortunately, Green Planet has developed a preventative season long solution that will reduce mosquitoes in your yard. This program targets mosquitoes where they live and breed from the perimeter of your house to the property lines around your yard. The applications involve 4 seasonal sprays to the perimeter of your property, in and around the trees and shrubs, and under the decks and against the house. These sprays target hiding spots where mosquitoes congregate waiting to feed on you and your family. These applications will make your property undesirable for mosquitoes to hang around, greatly reducing the amount of mosquito encounters each day. Let Green Planet keep your yard free of mosquitoes this summer so you and your family can get back to enjoying all those fun outdoor activities again. With our Lawn & Tree Care treatments, your property will be the envy of the neighborhood! Give us a call and together, we’ll send these pests packing.